Carmen Tanase, is the young lady in the picture and the information below. In June 2017 we had an update from Carmen. Here is a note from Carmen to the couple that sponsored her when she lived in the gypsy village. "While I was writing some reports this morning, I suddenly recalled my past and thought about you. I do not know if this email will reach you, but I would like to update you about my situation and to thank you once again that you helped me and gave me the chance to have a work place that I wasn't even thinking I will get in my life. Without your help I would not be able to write you now in English and to pursue two Masters. In 2015 I graduated my second Master in Public Policy at the Central European University, since then I have been doing voluntary work and internships in several international organizations on Roma policies. Currently, I am employed from October 2016, in a European organization that deals with Roma policies at European level and collaborates with European Commission and European Parliament in Brussels, Belgium. Even though I am far from my community and work more in bureaucracy, I did not lose the contact with my roots. Through my work I am influencing the national polices to end the Roma discrimination, school segregation and insert Roma on the labor market. It is a very slow process but seems in some areas has a positive impact. The situation of Roma children who are trapped in the circle of poverty is still high but I do know that God is there to take care." Lives are being changed through Mission T o Serve and we thank all our sponsors for being our partner in the Lord's work. Read Carmen's story below to see how her life has changed. Below is a letter written by Carmen Tanase when she lived in a gypsy village before she went on to college. In the letter she discribes the everyday life of the gypsy girls. I graduated high school successfully. At this moment I am getting ready for College with God's help, and would love to try for Psychology or Sociology. I know that God is helping me. I know he will help me have a decent life and a happy family and not to have to spend my life working with the ground in the hot sun making bricks by hand and to live my life being a slave for men like the other girls in my village who are the same age as I am. We live in concubine status because we usually do not get legally married. My grandparents only married legally after 50 years of married and that was because they became Christians. Gypsies have their own judges among themselves and without lawyers. They are usually old men without education and their decisions are final even though they are not normally good decisions and they don't have to be "fair". They can be paid off by bad people and then the good people have to suffer. I am the FIRST and ONLY girl in my village who will try NOT to live this sort of life. I am the FIRST and ONLY girl in my village who has ever went to high school. And the first to go to College. All the people in the village laugh at me and think that I am crazy, but I do not want this kind of life. I want something better for myself and my children. In order to go to high school I had to live in a dormitory in another town, and even there we didn't have good conditions and it was cold. In order to go to College I must move to another city which is one hour from us and find a place to live also. I hope I can find a dormitory room there some place and find some kind of job because my parents don't have money to pay for this. Please pray for me that God will work everything out for me. My School Will cost $700 for this year which is a large amount for a Romanian family because the minimum wage here in Romania is $125 a month. My parents are in Germany right now trying to work and save money so my mother will be able to help me with some of the college costs. Helping children get an education!! 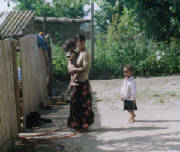 Many girls want to get out of the normal life in their villages, especially the gypsy girls. In Romania it is very hard for girls from any place to go to college because their families do not have the money for this. The same is true from the state orphanages. MTS has been helping young men and women to try to get a higher education if they are able to pass the college enterance exam. This is one of the "extra" things that we do, but we don't have special funds set aside for this. I pray that there will be some reading this that would like to help with these costs. Perhaps some Sunday school classes or various groups you know would like to help as a project. Please spread the word of this special need. I am sending a letter by a girl named Carmen Tanase that will help you understand a little of what some young people go through. The young men have the same problems with being able to afford school. I want to tell you how life is for the Gypsy girls. The girls marry at 13-14 years old. Those who are older that 18 years old will have a hard time to find someone to marry them or they will never be married or loved. For me in my village, just to get married now, because I am 19 years old, I would never get married here in Sadova. By the time the girls are 20 years old they usually have 2 or more children. Woman aren't allowed to have uncovered heads and they have to wear long skirts. If you are not a virgin, you won't get married because on the wedding night you have a white robe. The bride is dressing up in all white and the boy MUST see the shedding of blood in her. That is evidence that she is still a virgin. I am still a virgin and will continue to be one until my wedding. We are not allowed to have fun with men, or interact with them. We are not going much to school. Girls only learn to write and read a little and that is all. Usually the girls go to the 6th grade and maybe sometimes to the 7th or 8th grades, but they are usually married before they reach the age for 7th grade. We don't have the right to speak up because that will upset the man. We are beaten up really bad and no one will do anything about it, not even the girl's parents. We are treated really bad by men and have to endure this kind of life.